An artist''s impression of the building from the corner of St John''s and Balmoral avenues, Springvale. 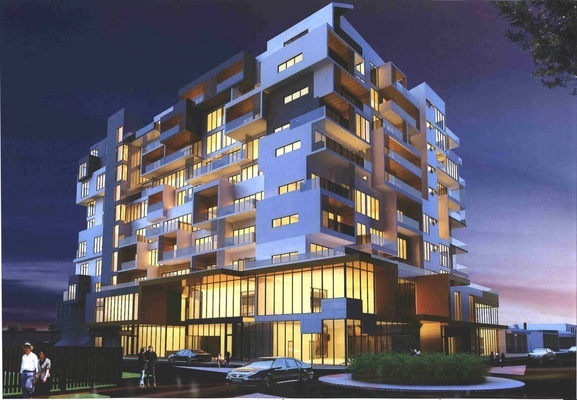 A proposed 10-storey multi-use apartment building has been hailed as a “historic” development in central Springvale. The proposal at 17-19 Balmoral Avenue for 89 apartments, a function centre and retail outlets was passed unanimously by Greater Dandenong councillors on 27 August. It includes 254 parking spaces across five levels – including two basement parking floors. This exceeded minimum parking requirements and would not create potential traffic issues, according to a Greater Dandenong Council report on 27 August. The proposal by Golden Australasia Developments was assessed as respectful of neighbourhood character and would draw patronage in the Springvale Activity Centre. “It sits well with the surrounding commercial and residential precinct,” city planning director Jody Bosman told the council meeting. Mayor Youhorn Chea said the proposal was a “historic building that Springvale would like to have some more of – not just one”. Councillor Sean O’Reilly hailed the approval as an “important and historic decision”. New housing was needed for the 150,000 new Victorians every year as well as the younger generations being squeezed out of the housing market, Cr O’Reilly said. Cr Heang Tak added that the development would provide office space, dining and event-hosting options.